I’d like to discuss the form and shape of what we call integrative oncology. As we know, oncology means the field of medicine that works with people who have cancer. The word integrative means that bringing together different things. In the United States, there has been a big movement since the ’50s and ’60s to bring about what we would call integrated schools. Also, we integrated people of color with Caucasians bringing them together. The meaning of integrating is bringing things together. Integrative oncology is bringing together what? Bringing together all of the different modalities of healing, the healing modalities. And there are many healing modalities. We’ve got the traditional ones, which are Ayurvedic medicine, Traditional Chinese medicine, botanical medicine of Europe and the United States, Native American medicine, and homeopathic medicine. And then there are more modern modalities like chiropractic, osteopathy, and then, of course, allopathy, which is the M.D. Every one of those has its place in healing human beings. So the art, the finesse, is to find the best of each of those and bring them together into an integrative approach. And that’s basic meaning of what integrative oncology is. 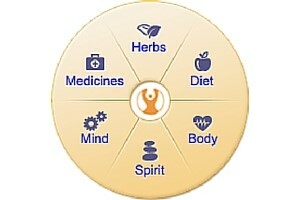 We use herbs, we use acupuncture, we use cleansing, different types of cleansing, and different kinds of energy work. And we use IVs, interventional IVs of high doses of vitamin C and other botanically derived substances in addition to working on the mind and body connection. The mind, body, and spirit are really one thing. We separate them just so we could talk about them. But I mean, you get into an automobile accident, what happens? You hurt your body? Yeah. Anything else happens? Were you emotionally affected? Yes, absolutely. Psychologically affected, spiritually affected? Yes, all those things happen. You can’t separate them. They’re not separable. That’s just how life happens. Life happens on all these levels at once so we have to deal with that. We have to deal with our ability to clear the mind. Just like you do a colonic or enema to clean out your bowels, you need to do a mind enema. You need to clean out the fears and clean out the madness. There’s a lot involved when it comes to cleansing but it must be done. And basically, we’re talking about dealing with the whole person and not just the toe or some other singular aspect of it because that would be missing the entire point. An example of missing it would be the old proverbial blind person holding the tail of the elephant and trying to tell you what an elephant looks like. And another person is holding its front legs, and another person is holding the trunk, and another person is touching its abdomen, the ears and trying to tell you what it looks like. These are aspects of the whole and they’re not going to give you any idea of what the whole is. That is what integrative oncology is, it’s bringing it all together. And if you haven’t brought it all together, if you are just using one or two or three methods, then it doesn’t really qualify as integrative oncology.